Ballistics101.com would like to extend a warm thank you to Matthew Birch for writing and sharing this article with us. We hope you enjoy his clever experiment as much as we do. Does your magazine loaded wear out the spring or not? The accepted wisdom seems to be that leaving magazines loaded does not hurt the magazine spring. 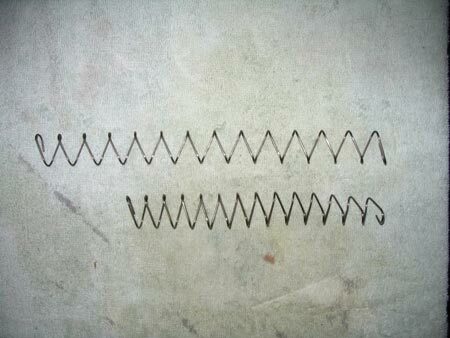 The loss of stiffness comes from cycling the magazine springs. This has always made sense and seemed to agree with most of my engineering classes. Creep is a material property that you see most often in plastics and with modern heat treating should be pretty much none existent in good spring steels. Well this small experiment seems to point to the possibility of other conclusions. So here is how my simple little experiment plays out. 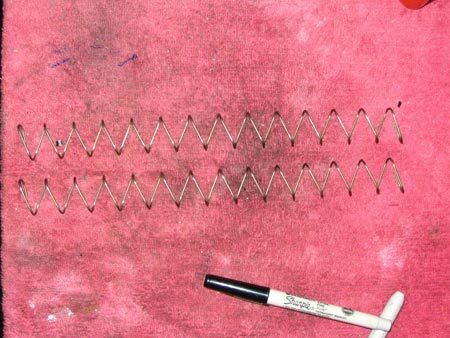 First I start with two identical magazine springs. These are Caspian magazine springs that I had bought hoping they would work with my extended capacity base pad project for my XD. I had bought three of the spring and when they did not work in the XD magazines I had two unused springs and the idea for this experiment came to mind. The original spring never compressed fresh out of the factory package. So with two new magazine springs I made a quick fixture out of some junk in the garage (a long bolt, nut, washer and a ceiling light mounting bracket). I placed one of the unused springs on the fixture and ran the bolt down to where the spring coils were just starting to touch each other just like the spring would be in a fully loaded magazine. I did not torque the bolt down tight just turned it down just enough to nearly make the spring solid. The spring on the fixture, compressed down to near solid length. Now the waiting begins. I did this original part back on 01/29/06 and waited. In fact I almost forgot about the springs and the experiment as a few boxes got placed on the shelf in front of them. I found them today (04/15/07) looking for some parts. So all in all I left that spring compressed for ~ 14.5 months. 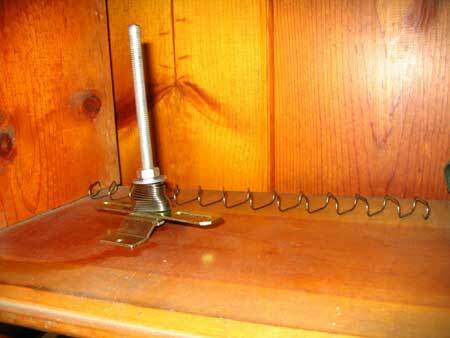 The springs on the fixture stored on a shelf for 14.5 months. So after 14.5 months of waiting I take the compressed spring off of the fixture. Wow that spring took a set! Now keep in mind that all springs take a set the first few times they are compressed so although this might look really bad its not as bad as it first appears. The springs after the compressed spring was released. The top spring was never compressed the bottom spring was compressed on the fixture for 14.5 months. 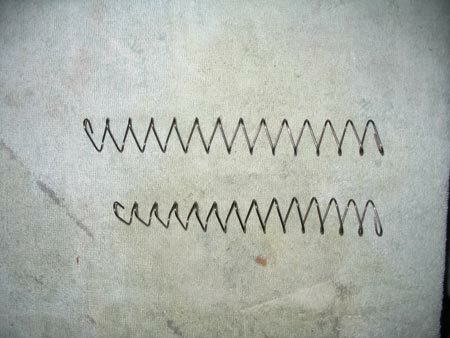 So we need to compress and cycle the spring that has never been compressed. So I used an old shotgun cleaning rod as a guide and the ceiling bracket to compress the never compressed spring 5 times. 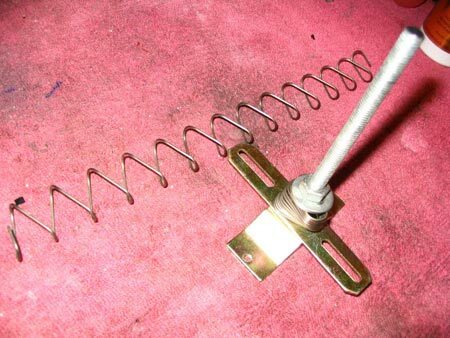 For each cycle I compressed the spring to solid length and release. 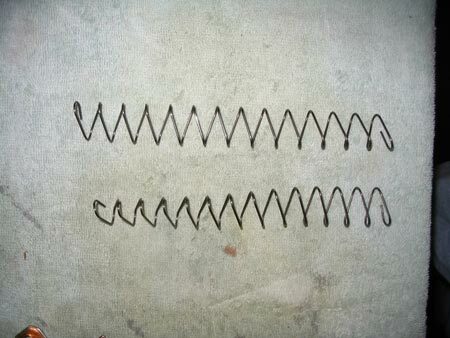 The springs after the never left compressed spring (top) was cycled 5 times. The top spring was never left compressed the bottom spring was compressed on the fixture. The springs after the never left compressed spring (top) was cycled 30 times. The top spring was never left compressed the bottom spring was compressed on the fixture. To go one step further I cycled the spring another 100 times for a total of 130 compression cycles. As you can see the spring is closer to the same length but is till longer than the spring that was compressed for and extended time on the fixture. The springs after the never left compressed spring (top) was cycled 130 times. The top spring was never left compressed the bottom spring was compressed on the fixture. Well after 130 cycles the spring that had not been left on the fixture is still noticeably longer than the spring that was left on the fixture. So there is a certain amount of set a spring takes when left long times compressed. The real question now is how did the extended time compressed effect the spring rate of the spring? Well using a store bought scale I compressed both spring to 1.5 inches. This was not to solid length as that length was about 7/8 of and inch. The spring that was on the compression fixture of 14.5 months produced about 10.0 lbs. of force. The spring that had not been left compressed and was cycled 130 times produce 11.5 lbs. of force when compress to 1.5 inches. It seems that, at least in this particular case and conditions, the spring that was left compressed for an extended amount time has loss some stiffness due to this prolonged compress condition. I cannot make any conclusive conclusions from this simple impromptu experiment. I do think it maybe calls for further research. 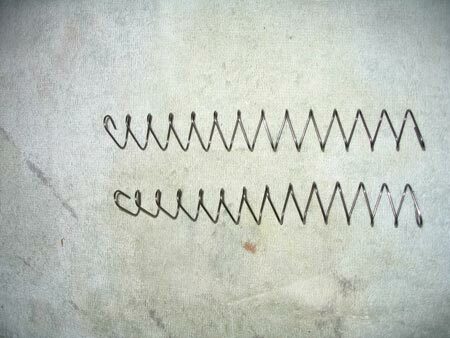 I do think that leaving a magazine spring fully compressed does cause a lost of stiffness. I also suspect that only a certain amount of the spring stiffness is lost this way and that at some point this loss of stiffness due to prolonged compression ceases to get worse. It would be interesting to have done several more springs and release one spring every so many weeks/months into the experiment. We could have seen how much and over how much time was the stiffness lost. I suspect is happened relatively quickly and at some point in time longer time left compressed does no more harm. More experiments are definitely called for.